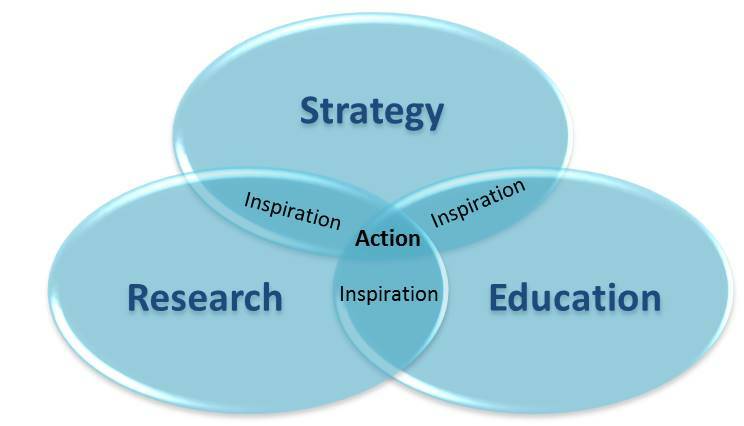 From strategic inspiration to action! Accelerating global challenges – and opportunities – mean business as usual in twenty, ten, or even five years, will be radically different to what we have known before. In an age of turmoil where visibility on the future is low, one thing is clear: Being able to anticipate and plan for change is more critical than ever, but few businesses have strong capabilities in this area. The missing link is often not information but the ability to translate trends and changes into actions that can drive future success. Strategy Dynamics Global SA helps organizations and their leaders to navigate a complex, interconnected and uncertain world to move from strategic inspiration to action to drive future success. Our ultimate aim is to help organizations and their leaders translate information about the changes in the world around us into positive actions today that can drive future success. The strategic inspiration of trends analysis is necessary but not sufficient: insights into what it means for your organization and corresponding action is the goal. Depending on where your organization is in the process for moving from information to action, each of our integrated suite of services can be tailored to your needs. Research activities focus on providing inspiration, both about the implications of change, and about how to move from trends to action. Our reports provide frameworks and data-rich analysis of key areas of changee.g. digitalization, demographic and social shifts, offering insights for all organizations into the potential implications of major changes. Flagship publications include The Global Trends Report 2013 and The Global Trends Fieldbook. Industry Briefs look at how trends will impact specific markets, while free monthly briefings, interviews, and articles offer more food for thought. We also undertake customized research for clients on specific markets and topics, informed by trends, e.g. market and competitor analysis, innovation assessments, and digital marketing innovations. Educational activities focus on expanding understanding and application of global trends among your target audience. This includes developing general and customized educational materials, e.g. case studies, trend overviews and toolkits to explore the specific implications of trends for your organization. We also work with leading companies, educational institutions, business networks and conferences to create executive education and trend exploration sessions that bring global trends to action thinking into your organization. Strategy is about looking forward, understanding the strengths of your organization and the opportunities and challenges faced, to build a vision, develop options for success, make informed choices, and plan to achieve it. Trends are a first input, but ultimately developing strategy is about harnessing hearts and minds to developing a compelling ambition and taking action on it. We offer significant experience with leading companies around the world in developing fully customized programs and sessions to drive strategy and innovation, as well as broader workshops on trends to strategic action and innovation. We also undertake speaking engagements on strategy and trends topics. Our clients span continents and industries, from Europe to Asia, Africa and the Americas, and across sectors as diverse as consumer goods, pharmaceuticals, utilities, B2B engineering, consultancy and the public sector. We also work with leading academic institutions and not-for-profit groups. · Working with the CEO and top team of a global chemical, environmental and next generation materials company to develop a clear ambition, vision and strategy both to deliver in the short-term and to position for long-term success over the next 20 years, including developing new markets, capabilities and technologies. · Facilitating the process of sharpening the strategy of a leading global snack company, including identifying new markets and initiatives to drive growth, with the CEO, executive committee and senior teams worldwide. · Designing and developing a journey/process to assist the CEOs/senior leaders of (predominantly) food and beverage SMEs in developing their strategies, organizations and leadership capabilities, in conjunction with a leading industrial development organization. · Session to explore the trends and potential implications of younger generations entering the workforce for the European HR team of a global FMCG company. · Working with a leading industry foundation to assess potential projects in terms of innovation around sustainability. Click here to download our brochure to find out more about what we do.